Stringing Materials : Blue Santa Beads, Endless Possibilities! Never Use Dental Floss or Nylon Filament (fishing wire). Clear, bronze, black stringing wire in sizes .018, .015 and .012. Better than Nymo; similar to Nymo D-size thread. A braided translucent monofiliment developed to keep the sharp edges of crystals and beads from cutting through thread; 100 yard/spool; sizes .015 fine (6 lb test); .027 medium (17 lb test); .032 heavy (25 lb. test). Used to create intricate and decorative knots frequently found in traditional Chinese arts and crafts. Nylon in .8mm and 1.2mm in 82 yard bundles. Available as 2 oz. bonded, 170 yard spools. Inexpensive and varied colors but lacks sheen of silk. Will stretch and eventually rot. Good for kids to practice. Made in India. Available in 1mm and 2mm sizes on 100 meter spools. Traditional braided cotton with an elastic center; available in .6mm and .8mm. The strongest clear elastic on the market made in Japan. You can crimp, knot or fuse the ends. Very flexible and extremely strong; stretches freely and returns to its original state. Sizes: .5mm, .8mm and 1mm. Flat silk perfect for giving beaded flower steams a more natural look. Comes in 5 meter skeins. Similar to Power Pro. Spun polyehtoline, fused into a super fiber. This pre-waxed braided cord has high tensile strength. Known as the strongest fiber, per diameter, ever created. The color is similar to smoke grey; 50 yard/ spool. Will fit a #12 English beading needle. An alternative for leather cord. Genya lace is made in the U.S. from a unique polymer system impregnated with natural plant fibers. Light weight, inexpensive, colorfast, rot and mildew resistant and very strong. Available in 1mm and 2mm diameters on 100 yd. Spools. Soft elegant textured floss similar to dental floss but has an elastic quality that stretches to 700% its original size. Threads through 10/0 seed beads and 3 and 4mm crystals with a big-eye needle. No need to use crimps; knots tie securely. Premium quality European round leather. Supple texture makes it ideal for quality stringing. Heat pressurized and dyed. Available in 50 meter skeins. Good for large beads and pendants. Thicknesses are: 1.5mm, 2mm, 2.5mm and 3mm. Convenient for only one or two necklaces. Needles already attached and thread is already doubled on the card. Needles not reusable. Approximately 79” (2 meters) of thread per card. Available in sizes 0-16. Nylon cord with needle attached. Available in sizes 0-16. Approximately 79” (2 meters) of thread per card. Stronger than Nylon or Silk. Virtually no stretch. Available sizes 0-16 (0=0.30mm and 16=1.05mm). Approximately 79” (2 meters) of thread per card. Smooth twisted three ply 100% silk thread. Most luxurious feel and softest sheen of any natural fiber. Extremely supple, yet resistant to stretch and wear. Durable enough to withstand the abrasion of pearls, glass beads and gemstones. It is plied from pure Chinese long filament silk. Available on cards and ½ oz. Spools. Sizes: 00,0, A, B, C, D, E, F, FF, FFF. Premium quality hemp cord from Hungary; perfect for large hole beads: 100 gr., 200 gr., 500 gr., and Cord 500 gr. A 0.10 diameter, nylon, monofiliment cord with unbelievable strength yet is soft and durable. Excellent for tin cup or illusion look necklaces. Available on 50 meter spools. An economy alternative to Greek leather. Good quality; available in same thicknesses as Greek. Finest woven waxed cord made in Japan, featuring a high smooth polish for a sophisticated look. 1mm has monofiliment core for added strength. Sold by the skein in 1mm or 3mm thicknesses. 19-Strand wire is strong, durable yet soft to the touch. The product is free of any tension so it exhibits no corkscrew effect. Knots easily; kink and stretch resistant. The special HiFlex coating provides abrasion resistance and maximum flexibility. Available in waxed or bonded on 18/2 ply or 18/3 ply. Strength tes6ts from 6-25 lbs. Super strong, yet very fine. 50 yard/spool. Used in making bullet proof vests. It is the strongest synthetic fiber in the world with less than 1% stretch. It is heat resistant and less likely to stretch over time. A variety of weights and colors; from ½ mm to 2 mm. It knots nicely. Is soft yet strong. Available in .010 (clear) and .012 (blue) diameters. Package contains @12 stainless steel coils for rings (3/4” diameter); bracelet (1-3/4” diameter); necklace (3-3/4” diameter). Nylon bead cord used for knotting between beads. Includes pre-strung needles. 15 yards per spool. Similar to silk in appearance and weight; somewhat stiffer and stronger. Cord can be knotted and comes in same calibration system as silk. It’s available on spools and cards. A heat set, bonded, no-stretch nylon. Available in cards, ½ oz. spool and 4 oz cones. Cones available in black and white only. Nylon thread similar in consistency to dental floss created for the shoe industry. Good for fresh water pearls, seed bead necklaces, beadweaving but not for heavy beads. Comes with a waxed finish except for A. Comes in two different measurements: 000, 00, and 0 (thickest) or A, B, C, D, E, F, G (thickest). 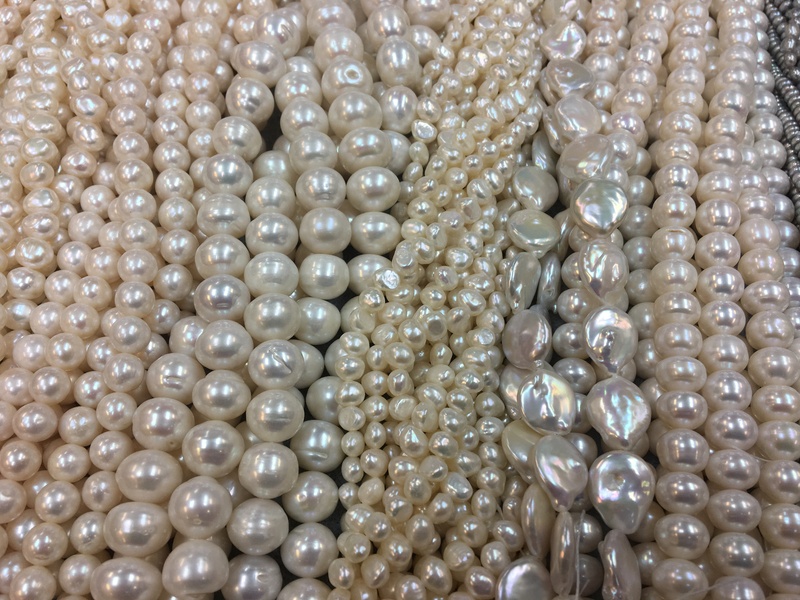 B (72 yards) or 00 for weaving seed beads; D (62 yards) or F (43 yards) for freshwater pearls or seed bead necklaces and bracelets (might best double thread). Also comes in 3 oz. Cones, spools, large bobbins and bobbins. A flat fibrous cord which doesn’t require crimp and has unbelievable strength. Knots remain virtually invisible. 7mm diameter available in white on 5, 25, 100 and 4,400 meter spools. Nylon-polyester sheer 3/8” wide ribbon used in necklaces. Can be threaded with a big eye needle. A specifically blended polymer that looks like fine Greecian leather. Unlike leather it will not crack, weather or smell. It is strong and can be crimped. Available in 1mm and 2mm diameters. Used with bead knitting and crocheting. Available in #3 and #8 which is perfect for size 11 beads. Strong, flexible, pre-waxed braided bead thread. Most beads will not cut this product. It knots easily and does not stretch. The 10 lb. test will thread onto a #12 or #13 beading needle. Consistency of a heavy thread; strength of a coated cable wire. Used with crystal, gemstone chips which have particular sharp edges around their holes; white and moss green on 28 or 100 yard spools. Rat tail is a satin cord which comes in many colors and knots well. Rat Tail is 2mm thick; Mouse Tail is 1mm thick. Used for Chinese knotting and stringing large beads. A soft and supple alternative to the Tejas or Split suede laces. Available on 25 yard spools in 2.5mm or 3mm, 1/16” thick. Matte finish black rubber tubing with a solid core. Perfect to use with sterling silver components. Available in 1mm and 3mm thicknesses. Pretreated nylon thread. Very fine and fluid; does not fray. Used with real pearls; works well with semi-precious or glass beads. Sized 00, A, B, C, D, E, F (best all around weight), FF, FFF (AA the thinnest; FFF the heaviest). Larger amounts on spools and used with twisted wire needles. Is a continuous filament, waxed polyester cord. Its durability makes it ideal for heavy glass and ceramic beads. The cord can be split to make thinner cords. Available on 1 oz. (125 ft.), 4 oz. (500 ft.) and 8 oz. (1000 ft.). 21 Strands: .014 Diameter: Made with 21 micro wires woven together with a nylon coating. This diameter was designed for softer, less abrasive materials such as pearls and seed beads. 49 Strands: .019 Diameter: The all-purpose diameter for lampwork, crystal, glass, metal, silver and pewter beads. It will pass through a #13 seed bead twice. 49 Strands: .024 Diameter: It can pass through a #11 seed bead twice. Excellent for multi-strand designs, African trade beads, semi-precious stones and mineral necklaces. 24k Gold plate over 21 strands of stainless steel wire is supple, flexible and easy to knot. Available in .014, .019 and .024. 50% more supple drape than Soft Flex; gives movement. Available in .010, .014, .019 and .024. The .010 is thin enough to be threaded onto a special stiff needle. Nylon thread strong enough that doubling isn’t necessary; doesn’t shred; non-tangling and non-clinging. It will fit a #12 beading needle. Works like a cross between Nymo and Silamide. 3mm x 1/8” thick thong made in India. Similar to Tejas leather lace but at a better price. Strong and stretchy; similar to elastic; easy to knot. Available in 1mm and .5mm. Excellent look and feel; used with Native American crafts. Measures 1/8 x 3mm on 25 yard spools. A nylon-coated braided wire cable. Used for heavy or sharp beads. Can’t be knotted and won’t drape as nicely as silk or nylon. Can withstand lots of movement without breaking. Sizes: .012, .015, .0l8, .020 and .024 (Extra Thick). The .012 and .025 diameters are constructed with 3 strands, the .018, .020, .022 and .024 are made with 7 strands. A two-ply twisted nylon thread, used as an alternative to Nymo but thicker than Nymo. Use a 10/0 needle or twisted wire need. Available on cards (40 yds.) or spools (900 yds.). A synthetic suede-like product; it is soft and strong. 3mm wide by 1” thick. Availabe on 100 yard spools. A substitute for leather cord which is ideal for stringing pendants; has a shiny finish. Sold by the skein in 1mm or 3mm thickness; 82 yards to a skein. Tightly woven cord which knots tightly for adjustable cord bracelets and necklaces. Comes in 3/32 thickness and 144 yards to the spool. Perfect for heavy projects such as dreamcatchers and mandalas and for macramé and bead stringing. Very strong and waxed enough to be manageable but not sticky. 10 yd/spool.